FibreJet is the truly affordable SAN Management solution. A FibreJet managed enterprise-class storage network gives multiple computers operating on multiple operating systems concurrent access to multiple terabytes of storage using just about anyone’s storage over Fibre Channel or iSCSI. Higher-performance storage networking. FibreJet has shown in real world application to have as much as 500% better performance during file-copy compared to the same operation on other SAN management software. On SAN networks using FibreJet operators are able find a file in as little as 5 seconds as compared to taking as much as 4 minutes and more for the same operation in many other well known SAN management solutions. FibreJet is the proven choice for storage and server consolidation; higher performance, lower cost, easy scalability with higher availability when you need to work together. Sharing. It’s a good thing. FibreJet is a true multi-platform sharing solution. Whether you are a MAC OSX user or a MS Windows 7 user, FibreJet lets you share files and volumes of virtually unlimited size over a Fibre Channel based network or over an Ethernet iSCSI network. 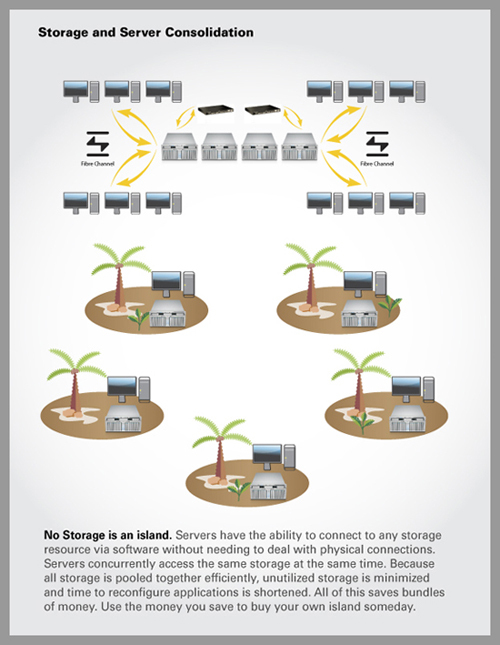 Virtually unlimited systems on the SAN can read and write to our shared storage simultaneously. Using your favorite standard disk utilities, you can pool data across multiple SAN storage (both RAID and JBOD) for enhanced performance. Each SAN attached computer accesses the storage as if it were directly attached, giving extreme performance for demanding applications such as sharing HD video with a workgroup of editors, or cluster computing where high speed access to a shared data set allows each computer to calculate at maximum efficiency. Work together. like never before. Since all the SAN attached machines see the storage as if they were directly attached, you can share media with a virtually unlimited number of machines concurrently, enabling comprehensive workgroup functionality like never before. FibreJet truly gives you the freedom to collaborate. While many claim to play well with others FibreJet actually delivers on the work together promise. With true best of class choices in all areas, FibreJet not only works with Fibre Channel switches from enterprise class vendors like QLogic, Emulex and Brocade; more than that FibreJet also gives the customer choice when it comes down to their choice of Storage and HBAs. FibreJet will work with just about anyone’s RAID or JBOD storage device. In addition FibreJet also lets you mix and match your choice of HBAs, from manufacturers such as QLogic, ATTO, Apple/LSI, etc. Higher availability. FibreJet has less single points of failure than any other SAN management solution. FibreJet is based on full Fibre Channel SAN architecture; as a result the entire network can be provisioned for redundancy with RAID and Fibre Channel switch fabric topology. Additionally, there is no metadata controller that can fail, no additional server to administer, and ultimately no additional cost to impact your bottom line! Easier to Setup, Easier Scalability, Easier to Manage. Setup is as simple as FibreJet. So is using your storage. FibreJet storage works just like your current storage, there is nothing to relearn. You have the freedom to grow your network without disrupting users by simply adding or reconfiguring switches, storage, and servers as they become necessary to your business development. Your storage is simply there like any other disk. Management is built into every FibreJet seat. It can be managed from any machine on your network or remotely managed using Apple Remote Desktop or any similar remote access desktop application. You can purchase FibreJet by contacting your local FibreJet Authorized Reseller.